There is something about pancakes on a Sunday morning that is absolutely perfect. It could be the mere indulgence of taking time to whisk together a smooth batter, or the satisfying sizzle of ghee in the skillet as it accompanies the crinkle of the weekly newspaper. Or the dazzling taste of maple syrup drips enjoyed from fingertips and the charming, delightful color of fresh berries speckling the plate. On these mornings, if but momentarily, the buzz of the outside world is suspended and my kitchen is enveloped in a symphony of joyful breakfast-making sounds. While I whole-heartedly enjoy traditional pancake recipes, I have been trying to perfect the craft of gluten-free pancakes for some time. 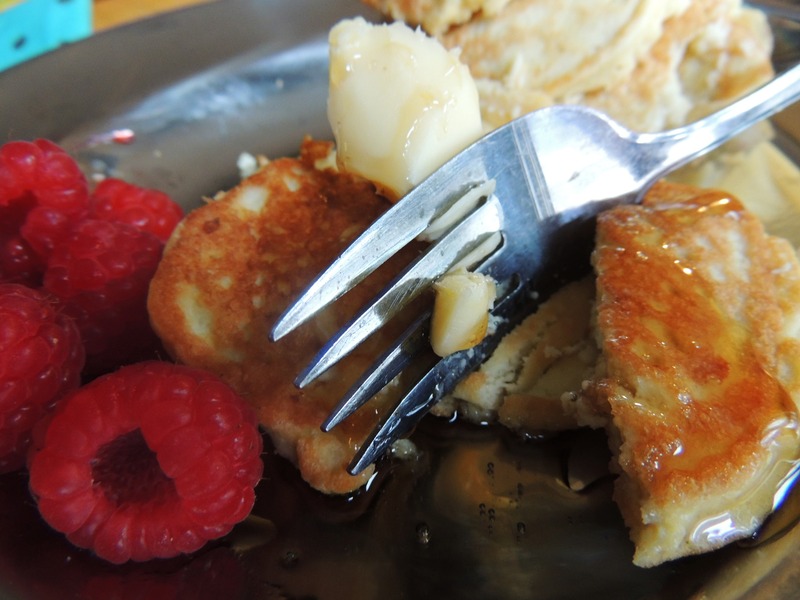 Yesterday I whipped up this innovative recipe for organic coconut flour pancakes using bovine gelatin, and was pleasantly surprised by the mouth-watering golden stack flipped onto my plate. As divine as coconut flour can be with its gentle, warming flavor and impressive nutrient profile, cooking with it can be very tricky indeed. Sunday mornings with gluten-free pancakes have not always been a sparkling success...I have had plenty of 'experiments' resulting in my standing in the kitchen with hands on hips, sporting a disgruntled frown and staring at a lackluster pile of dry pancaked-esque creations plopped onto a plate. If you dared try to sink your fork into one of those oddly-shaped things and it would collapse into a wimpy heap of crumbs. Because coconut flour is dense with fiber and does not contain the elastic gluten protein to act as a binder, it requires a little extra help from other ingredients to cook it into a truly satisfying, tender final product. This is generally achieved with the use of eggs- most recipes for coconut flour goodies call for the use of about 6 eggs per 1/2 cup of coconut flour. This particular pancake recipe also employs gelatin as a sidekick, to keep the pancakes moist and pleasantly fluffy, without being sticky. Although it may not sound glamorous or appealing, high quality, bovine gelatin is a surprise ingredient in many traditional recipes, finding a place blended into cheesecakes, simmered into bone broth, sprinkled into fruit jigglers and even mixed with water to create all natural hair gels. From a nutritional perspective, it is really the perfect compliment to coconut flour as well. Because gelatin acts as a protein sparer, it enhances the digestibility of the natural proteins found in both coconut flour and eggs, making these unique pancakes a relatively balanced, energy-boosting delight on lazy mornings. 1. In a medium sized bowl, sift together coconut flour and gelatin. 2. Beat the eggs into dry mixture, stirring until well combined. Batter will have a thick paste-like consistency. 3. Add in butter or coconut oil, mixing thoroughly. 4. Stir in coconut milk and vanilla extract. 5. Heat 1-2 tablespoons of coconut oil or ghee in skillet. 6. Spoon batter onto hot skillet, making pancakes about 3 inches across. 7. Cook until bubbling and opaque around the edges then flip. The pancakes will have a lovely golden-brown tone. Thank you to Lauren at Empowered Sustenance for her incredibly brilliant work and the recipe inspiration.